Welcome to the forums Mialere! Mialere, welcome to the forums. Even if you usually don't visit forums, it's nice that you registered. That's the first step. Take a look around, there's art and there are other comics here, there is a roleplay section and there are the forum games. And of course we have a place to discuss the comic and one to discuss other things (Not the Comic ). You will surely find your spot. Welcome here Miguel. Great to read the comic since long time, its reading can also be a good way to practice English knowledge. Welcome to the forums Mialere. I hope that you have a great time here. Hello! Stanlee Collier. My friend Doug dragged me onto the forum, but I think it'll be fun. And welcome to you, my friend! Have fun with the forums - or I'll pester you until you do. Welcome to the forums Stan! Nice to meet you! Welcome to the forums. We are all a friendly bunch here. Welcome to the forums, Stan. Have fun here. Welcome Stan! Hope you enjoy it here! Welcome here, Stan! Enjoy your stay. I'm a little bit behind. Welcome to the Housepets! forums!!! Welcome to the forums Maus! Hi Maus, welcome to the forums. Welcome to the forum Maus! I hope you have a good time here. Welcome to the forums Stan and Typomouse! I'm new, though I've been reading HP since mid 2009-ish I believe. College and careers kept me a lurker for most part untill now. I have much more free time now, so I thought I'd join the fun. I little about me, I like reading, particularly fiction or military history, studying linguistics, and burritos. 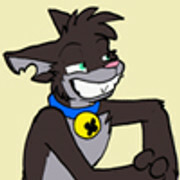 also I cropped an avatar out of today's comic, hope that's alright for now. Last edited by Lang on Wed Sep 10, 2014 11:54 am, edited 1 time in total. The study of burritos is quite prestigious, and a fun activity too. Welcome to the forums Lang. Last edited by Douglas Collier on Wed Sep 10, 2014 11:59 am, edited 3 times in total. Welcome, Lang. Great to have you! And that avatar is awesome! The study of burritos is quite prestigious, and a fun activity too. Welcome to the forums Lang. If only there was a school on that. Easily be class valedictorian. Welcome to the forums Lang! Welcome Lang, I'm sure you'll ahve fun on the forums. A new old comic reader is here. Welcome to the forum, Lang! Welcome everyone I have not said to yet! Hi Everyone! My name's Carl, but you can refer to me by my username if you'd like (or just "Blue" for short). I've been reading this comic for around a year and a half, but never really struck up the gall to join the forums. But after reading some threads here, you guys seem like pretty nice people, so I finally gave in, and here I am! Can't wait to discuss further arcs (and whatnot) of this great comic with some great people. Welcome to the forums Blue! Hi, I'm Sirberus, although I answer to lots of things. I finally convinced myself to join the forum and even say Hi, which took forever as I'm actually much more shy than I sometimes look. Welcome to the forum Sirberus! I hope that you have a really nice time here.